It is difficult to imagine what the PC market would look like today had Microsoft not introduced the Surface RT and Surface Pro back in 2012. The software giant created a category, set the benchmark for high-end productivity-oriented tablets, and pushed rivals, like Apple, to compete in this space. Despite this, Canalys CEO Steve Brazier and Lenovo COO Gianfranco Lanci believe that the Surface line will be put out to pasture by 2019. Why? The Surface business is not a huge money-maker for Microsoft, making it harder and harder to justify the cost to produce new devices and the low margins involved. "The Surface performance is choppy, there are good quarters and bad quarters, overall they are not making money. It doesn’t make sense for them to be in this business. When the capital expenditure challenge that Satya Nadella has taken Microsoft down becomes visible to Wall Street, everyone will ask him why have you gone to a low margin business," says Brazier. "It might be earlier. I share [Brazier's] view, Microsoft is making a lot of money on the cloud and enterprise and on Windows, and it is definitely losing a lot of money on devices and I see no reason why they would want to continue with the Surface," Lanci adds. The Surface line did not generate a whole lot of revenue in the past five years, with revenue rarely passing the $1 billion mark. It had a rocky start too. What's more, Brazier believes that Microsoft CEO Satya Nadella is a "software guy, a cloud guy," so he may have little interest in this hardware business. This is something that is undeniably true, but it is unlikely that Microsoft will want to give up on what is otherwise a solid range of products because they are not generating as much revenue as Wall Street or an analyst company may expect. Why? 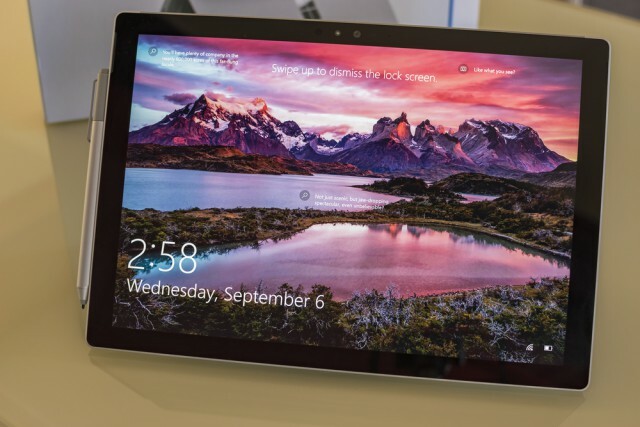 Surface shouldn't be viewed as a standalone effort, but rather as part of a long-term strategy. With the Surface line, Microsoft is not only making high-end Windows devices more attractive, it is also encouraging its partners to come up with better designs that appeal to a wider range of consumers. Surface devices are also putting pressure on Macs, giving consumers a legit alternative to MacBooks and iMacs. This is something that one cannot easily quantify, but it matters to Microsoft if it wants Windows to continue to be relevant years and years down the road. Think about Windows Mixed Reality for a second as well: it will surely not be a billion dollar business right away, but it does put Windows at the forefront of mixed reality. Ultimately, Microsoft really does not need to make a lot of money by selling Surface devices, if the range helps strengthen the Windows ecosystem and, in turn, create solid demand for Windows. Nadella may be a "software guy, a cloud guy" but he is playing the long game. So far, his strategies have paid off, so if Surface is still around it is not because Nadella is shortsighted or too lazy to pull the plug.